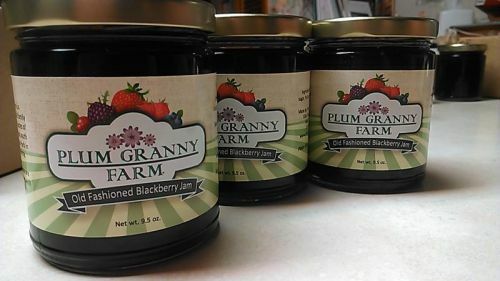 Plum Granny Farm Weekly Update for September 28, 2018 -- Happy to See You, Autumn! Posted 9/30/2018 12:20pm by Cheryl. Hello Farm Friends! Happy Friday! Happy Fall Ya'll! 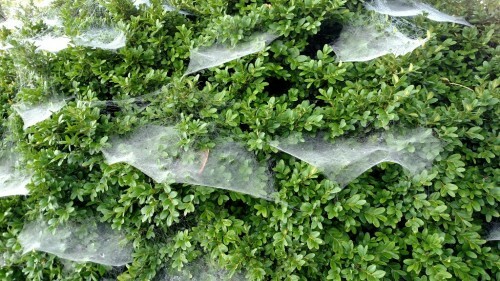 The foggy mornings and intense spider activity are conspiring to advance the calendar to Halloween -- or at least it seems. The front of the farmhouse looks like a stage set for some mighty spooky stuff! 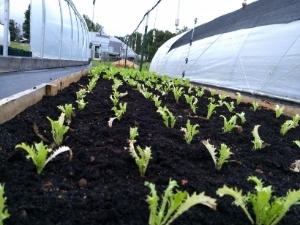 Got some planting done -- escarole and frisse have taken over where the beets were. Have to keep those beds flipping! 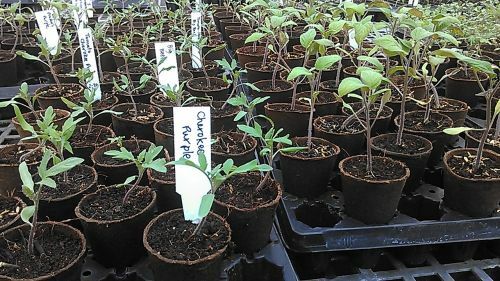 And a new crop of cucumbers is planted in the greenhouse. Fingers crossed that these don't succumb to disease. Have you seen the Monarchs? We are seeing lots of Monarch Butterflies swirling around the farm recently. 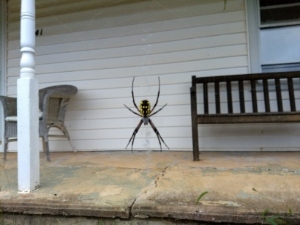 Now is the time for the annual migration from Canada to Mexico and the Triad is on that migration path. There was a great story on WFDD this week about how a couple of area researchers are helping track the migration and more precisely count the numbers of these endangered butterflies. It's really cool how this technology is being employed! What has been really interesting to us here at the farm is the number of Monarch caterpillars that we are finding -- don't recall ever seeing so many. 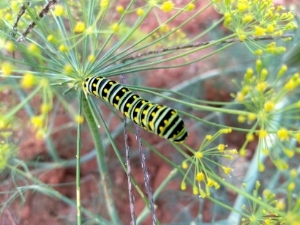 They are all over the carrot foliage and dill -- I counted as many as 10 on a single plant. The caterpillars have pretty much eaten all of the carrot tops but that's okay if it gives them what they need to turn into beautiful butterflies! We still have a few slots left for our Growing Great Garlic at Home workshop. But hurry -- the workshop is limited to just 15 people. It will be held here at the farm on Sunday, October 14 from 2-5 -- right in time for planting. The class fee is $35 and includes a 1/2 pound bag of seed garlic. To register, use our online form. Many of our market offerings are moving from Summer to Fall -- just like the seasons! 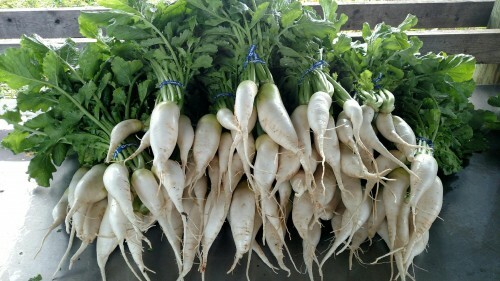 This week we'll have bunches of our crisp and delicious Daikon Radishes. Don't forget the Picnic/Lunchbox Peppers -- perfect size for snacking or for packing in your lunchbox! Almost seedless and VERY delicious. We'll have sweet red peppers including the Italian Roaster Marconi, Pimento, Lipstick, Red Bell and MORE! And if you are looking for the perfect appetizer, try Shishito Peppers -- great on the grill, seared in a skillet or cooked up Tempura-style. Yum! 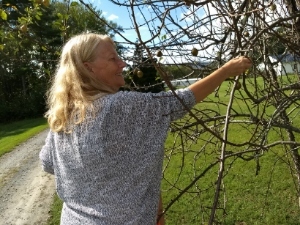 Many of you got your first taste of sweet, juicy Scuppernongs and Muscadines last week. We've got more this week! Come grab a pint of this quintessential Southern treat. 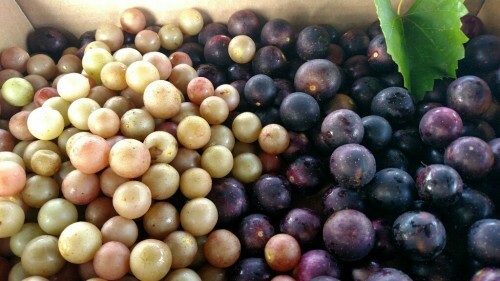 We'll also have Bintje Potatoes, Russets and boxes of tasty Creamers -- try roasting them on the grill. 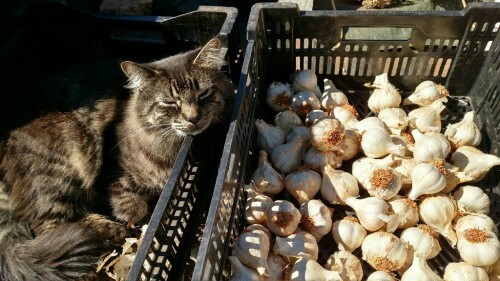 We are starting to run low on garlic -- so you had better hurry! We'll have at least 5 varieties of Bulb Garlic along with Garlic Sampler Bags and Garlic Granules. Rounding out the table will be Pea Shoots, Sunflower Shoots, Parsley, Okra and maybe some tomatoes. 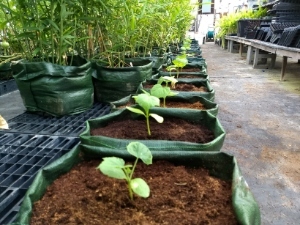 ALL of our produce is Certified Organic and we grow everything we sell! If you'd like us to save something for you, please send us an email by 10 p.m. tonight and it will be ready for pick-up tomorrow. 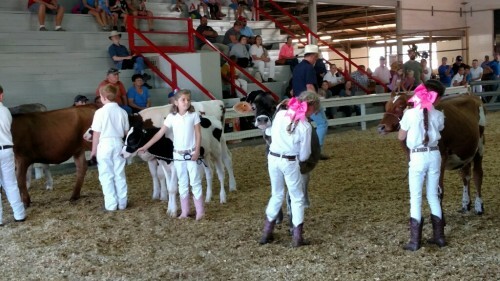 That's all the news from the farm this week. Lots of things happening over the weekend in the Triad: Hops and Shops on Saturday and Sunday, the Black Walnut Festival in Bethania (Saturday) and don't forget the Dixie Classic Fair (today through 10/7) -- you'll see us there sometime next week!